It’s always good to help people, you know, like lending a helping hand to a person in need, without any ulterior motive behind your gallant gesture what so ever. But who helps those who helps initially? The helping-helper. Maybe these people may know? Director: Frank Coraci; or Actors: Adam Sandler, Kathy Bates, and Henry Winkler. Especially in 1998, and for 90 minutes. I am afraid to say that Louisiana bound simpleton, Robert Boucher (Adam Sandler), has a lot of pent up aggression inside of him. His reclusive Mama, Helen (Kathy Bates), has sheltered him away from society. His Coach, Red Beaulieu (Jerry Reed), sacks him from his job as a Football laden ‘Waterboy’. Plus generally, he is frowned upon by whomever he meets. However, as luck would have it, the downtrodden Coach of 'the Mud Dogs', Klein (Henry Winker), takes pity on ‘Bobby’, and hires him to be his ‘Waterboy’. Moreover, Klein also discovers that he can use Bobby’s anger to benefit his team – by channeling Bobby’s ‘energy’ as a defensive line-backer, BANG! Please note, both Bobby and Klein have to hide this fact from Bobby’s Mama, Helen – as she feels that ‘foosball’ is the ‘devil work’. But still, this is a small price to pay considering that Bobby is very good in this endeavor, and that he can also gain a scholarship from high school in the process. Saying that, though, Bobby does use his 'new-found gift' in everything that he does. In school, BANG! On the field, CRASH! Plus when he reacquaints himself with his lost-love / career criminal, Vicki Vallencourt (Fairuza Balk), YAHOO! OK, I have to admit, that this does have a startling negative effect on Bobby overall. For a start, his Mama isn't too happy with him 'being' with Vicki. Also, his ex-Coach , Red Beaulieu, is threatened that Bobby's winning streak with 'the Mud Dogs', will rival an up and coming match with his own team, 'Louisiana State'. Still, I suppose that is why what next transpires if a right dip in the ocean I can tell you. As tests are taken - Mama's are shaken - football is played - and water is sprayed. 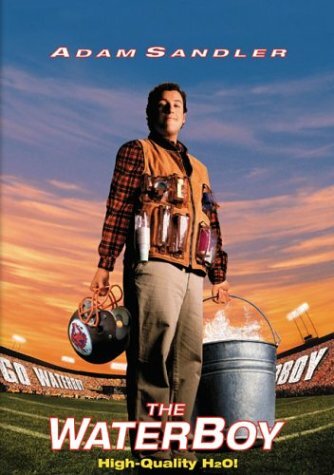 Now with my hand on my heart I have to state for the record that ‘The Waterboy’ is an Adam Sandler comedy with a lot of warmth to it, because it manages to tell the simple story of an inept simpleton who is able to find a place in a world that once shunned him. Granted, in essence, this film is also a sports comedy too. But at the same time is additionally able to encapsulate the whole 'transformation through acceptance' pretext, which always seems to tug at peoples hearts stings. Please note, I am not trying to imply that this is a market driven film, oh no, though I am sure that they made some cash out of it. What I am trying to say instead is that it’s basic pretext is a tried and tested formula - especially for Adam Sandler. You see, conceptually, this film tries to do something different with this ‘formula’, by adding a lot of character into the mix, just to make the overall experience feel somewhat comedic within the confines of the reality it presents. In the same vein as a ‘fado farce’, the structure of 'The Waterboy' relies heavily on emotional pitfalls and archetypal stereotypes. This way, you don’t really need a lot of exposition on who a character is, rather, you just need a basic nuance – like a way of speaking or a blatant costume – to convey on the who, the what, and the why, of a certain person's manner. A good example of this would be Adams character, Bobby. You get straight away on who he is by the way that he presents himself and by the rhythm of his speech. This can also be said for most of the other characters too, as they all seem to have some sort of affectation which makes them stand out from the crowd. Phew! Now that I am at the end of my review, just like 'the Waterboy' I best get something to drink. I’m feeling kind of thirsty giving all of this praise don't you know. A good film – a well performed film – and a very marketable commodity too. moondanceproduction made a real revolution in the industry.